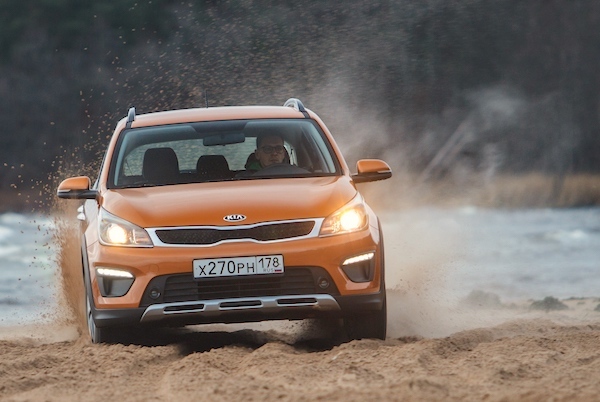 The Kia Rio is back atop the Russian sales charts in February. New car sales in Russia shoot up 24.7% year-on-year in February to 133.177 units, signalling the market is decidedly in recovery. Added with a 31.3% gain in January, YTD sales are up 27.5% to 235.641. Lada beats its home market with a stunning 37% year-on-year gain to 20.6% share, the carmaker’s fifth 20%+ share in the past year. Below, Kia (+44%) and Hyundai (+43%) do even better and round up the podium but GAZ (+20%), Nissan (+19%), Renault (+17%), Volkswagen (+11%) and Toyota (+3%) under-perform. Ford (+50%) and Skoda (+39%) are the other two manufacturers gaining market share year-on-year in the Top 10. Further down, notice Ravon (+191%), Honda (+132%), Mitsubishi (+97%), Mini (+68%) and Peugeot (+40%) posting solid performances while among Chinese carmakers, Foton (+767%), FAW (+657%), Zotye (+286%) and Dongfeng (+183%) all take off but remain at or below 0.1% market share. The Lada Vesta is up 66% year-on-year but down to 2nd place in February. Over in the models ranking, after the Lada Vesta snapped its first ever monthly pole position last month, the Kia Rio, Russia’s best-seller over the Full Year 2017, reclaims the throne, roughly following the market at +28%. The Vesta comes in second place with a spectacular 66% year-on-year gain ahead of the Lada Granta (+30%), Hyundai Creta (+46%) and Solaris (+49%) all gaining market share year-on-year. 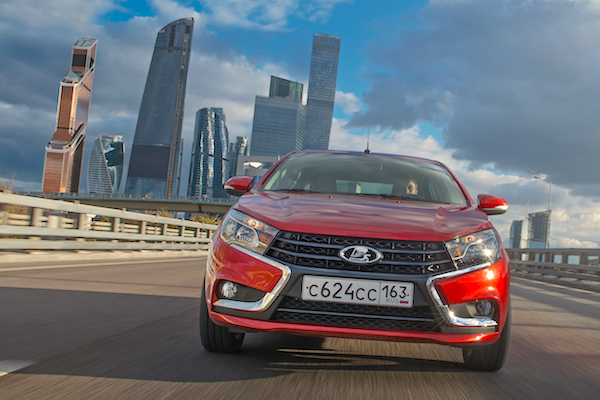 The Lada Largus (+76%), Kia Sportage (+68%), Datsun on-DO (+53%) and Renault Kaptur (+45%) also shine in the Top 25 while the VW Tiguan (+45%) equals its best-ever ranking at #12, also hit last December. Full February 2018 Top 55 All-brands and Top 25 models below.